The secret to gaining weight lies in a nutritious, protein-rich, and calorie-dense diet and an effective workout regimen. However, in an attempt to gain weight, you need not just pack on pounds by munching on junk food. It is always better to gain lean muscle mass rather than unhealthy fat. Having a healthy weight is not merely important for good looks but also for your overall health. Generally, it is believed that to pack on one pound per week, you need to take additional 500 calories a day. 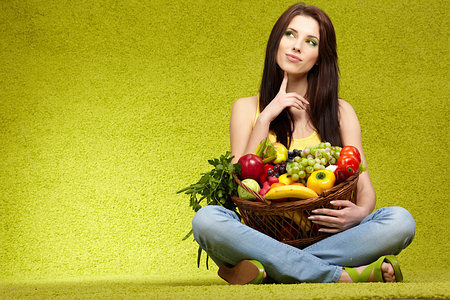 Here are some dietary tips and tricks for vegetarians to help gain weight. 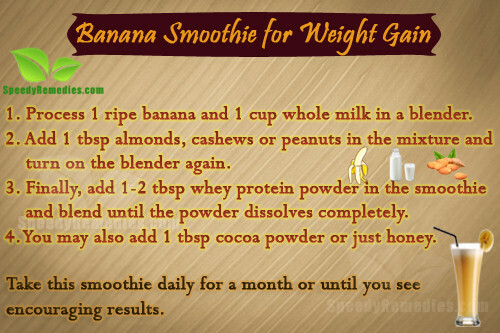 Create a Weight-Gain Smoothie: Prepare a banana smoothie by processing one ripe banana and a cup of whole milk in a blender. In case you are a vegan, replace whole milk with almond milk, soy milk, or simply fruit juice. Next add one tablespoon of almonds, cashews or peanuts in the mixture and turn on the blender again. Finally, add one or two tablespoons of whey protein powder in the smoothie and blend again until the powder dissolves completely. You may also add a tablespoon of cocoa powder or just honey in this recipe to add flavor. Take this smoothie daily until you see encouraging results. Mango and Milk: Though mangoes themselves do not promote weight gain, still when combined with milk they are beneficial for those who are striving to gain weight. So, you can either have mango slices along with milk or enjoy a delicious mango shake rich in calories, regularly for about a month. Figs and Raisins: This is a popular home remedy for those struggling with low body weight. Soak six dried figs and 30g or one-fifth cup of raisins in water overnight eat them in two batches the next day. Follow this remedy for about a month. Moreover, you can simply have 3-4 figs (soaked in water overnight) or one-fifth cup of raisins on a regular basis to pack on pounds. Almond Milk: Boil a few almonds, two dates and one fig in a glass of milk and drink it daily for a month to increase your body weight until you reach your desired weight. Clarified Butter: Add a tablespoon of sugar in a tablespoon of clarified butter (ghee) and mix it well. Consume it two times a day half an hour prior to your me.als. Also, try to increase the size of your meals by having almost 50 percent more in each meal than you previously used to have. So, eat larger portion sizes. Plus, eat an extra snack at bedtime. Modify your daily diet to include three large meals and two to three substantial snacks every day. Here’s an interesting snack idea- create a trail mix by combining one-half cup granola and one-quarter cup each of nuts and raisins. Raisins are also good for those suffering from low blood pressure. Replace your regular tea or coffee with milk, shakes, and fruit smoothies. Create a vegetarian protein shake at home by blending together a handful of fresh spinach, fresh or frozen strawberries, one cup of unsweetened yogurt, one-quarter cup of coconut flakes, two tablespoons of almond butter, two scoops of vanilla protein powder, and five ice cubes. You can also prepare other high energy liquid meals. For example, you can blend two cups of fruit juice, one cup of fresh or frozen fruits, one cup of yogurt, and one-quarter cup each of wheat germ or oat bran and milk powder. Another easy tip to encourage weight gain is to add sour cream or grated cheese to your soups and salads and slices of cheese to your sandwiches. When enjoying creamy soups and chowders though, make sure you have them in moderation because they are high in saturated fat. If you are semi-vegetarian then you can also add fish and eggs in your diet plan. Though chicken and other meat products are extremely popular for gaining weight, vegetarians can still rely on plant foods and prepare a proper weight gain diet plan to reach their desired weight. Apart from diet, you also need to include a good exercise regimen that aids in weight gain. Resistance exercises, in particular, helps increase your strength as well as lean body mass.